When shopping for clothes that are your style isn’t as easy as walking into Target and scooping up the latest popular tee, forethought is required. Don’t get me wrong, I am a big fan of Target. But to save money on those one-of-a-kind pieces that give your wardrobe a punch, look no further. 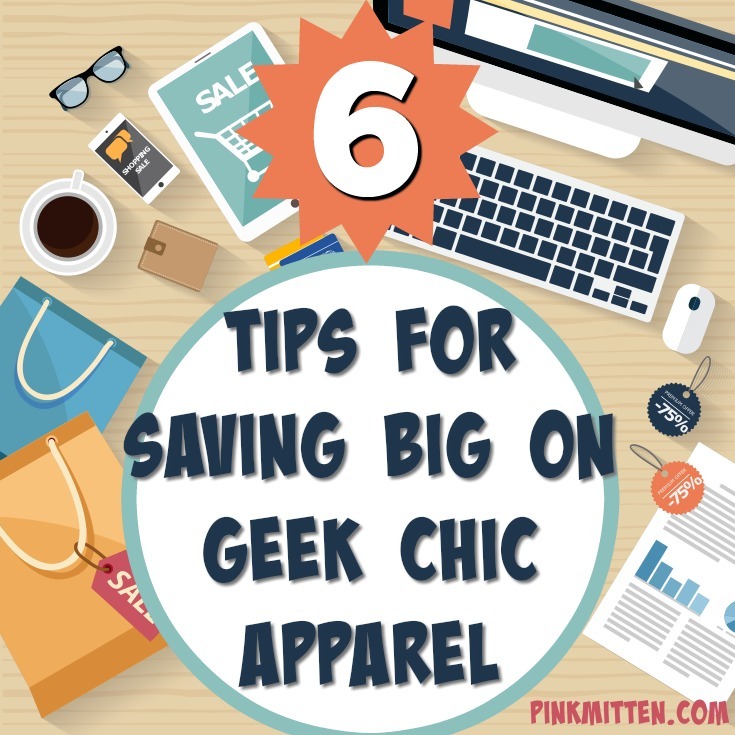 I am going to lay out 6 tips for finding deals on Geek Chic pieces to add to your closet. One way to stay on top of discounts and sales from your favorite companies and sellers is to sign up for their newsletter. This way you’ll be alerted when a new sale starts. If you’re not a fan of any extra, unnecessary emails cluttering your inbox, consider getting a second account. I have an email address I use strictly for these types of newsletters. Then, all the deals are in one place, when I need to access them. There are tons of bloggers and curators out there who are even more committed to style than you are. Follow those who embody the vibe you’re going for. That way you too can get the deals they’re finding. The end of each season is when shops, companies, and sellers purge their inventory. It’s is a good time to get stuff at a steep discount. You may have to wait until next season to wear your new buy, but come fall, you’ll be so glad you sprang for the deal. Along the same lines as following people with your taste, you can see what deals fellow geeks are finding. Search hashtags on Twitter to find the particular types of sales and stores you’re interested in. For instance, if I search #modclothsale, I can see what awesome geek-wear others are getting on sale. You’re already on Facebook half the day anyway. You might as well utilize this platform to be alerted when your favorite stores are having sales or offering coupons. This saves you from having to visit individual sites. If they’re having a sale, you’ll know about it. If you have to make a purchase and don’t have a coupon, check around on other sites for coupons. These days, there are tons of them at your fingertips just by checking Google before you hit the store. If you’re not familiar with eBay, I recommend you check it out. Many sellers stay on top of various fashion trends like Geek Chic apparel. You can find used or even new pieces here. You’ll be sure to find unique, one of a kind items here. Buy from a seller that has a high number of five-star ratings. Ebay sellers depend on the feedback buyers give them. For instance, those who have 3,470 5-star ratings, are committed to customer service. You don’t have to break the bank to stay true to your style. With these 6 tips, you’ll be able to slash clothing costs without sacrificing your style. How about you? What are your favorite ways to save on clothing? I love the tips, I normally just follow people that wear the same stuff I do, or those who’s style I go after. It’s good to sign up in newsletters as well, it’s perfect for catching the latest in your favorite stores! These are really awesome tips. Could help me save a lot of money when shopping! Newsletters do sometimes have great sales and things in it that you might not otherwise come across. I like when they do! This is such an great tips! I love sale and I can buy a lot of apparel. This is really a great idea, I love shopping and I love a good discounts, I would try to shop at the end of the season.